Roselyn Sanchez is being sued for allegedly stiffing her former management company out of some serious "Without a Trace" commission checks -- but this bitter, bitter lawsuit doesn't seem to be about the money. 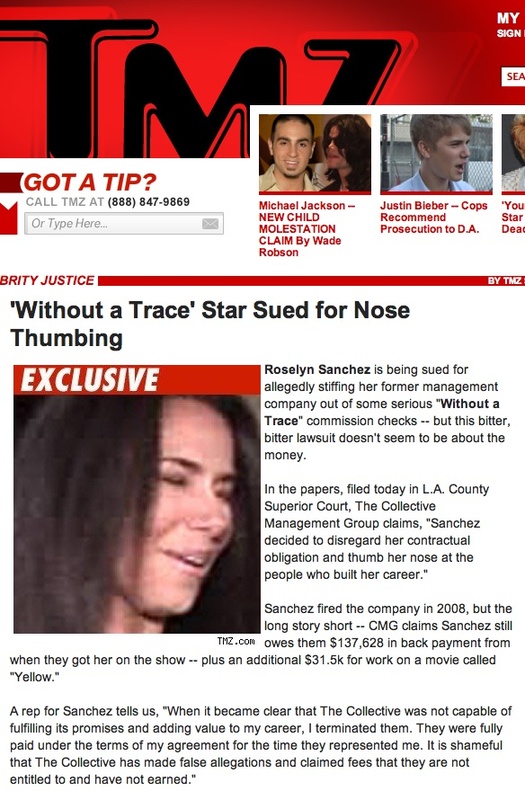 In the papers, filed today in L.A. County Superior Court, The Collective Management Group claims, "Sanchez decided to disregard her contractual obligation and thumb her nose at the people who built her career." Sanchez fired the company in 2008, but the long story short -- CMG claims Sanchez still owes them $137,628 in back payment from when they got her on the show -- plus an additional $31.5k for work on a movie called "Yellow."